How Much Does it Cost To Fly To Mexico City? The cheapest flights to Mexico City found within the past 7 days were $212. Prices and availability subject to change. Additional terms may apply. Seated in a boat gliding down an ancient canal, you begin to daydream. Nearby, vibrant colors on passersby jolt you back to reality, which is nearly as divine as any world you could create in your mind. You’ve arrived in a place where Aztec temples share the terrain with baroque cathedrals and thriving shopping centers. You can take a deep dive into history just easily as you can consume modern art and sink your teeth into a tamale. Yes, you think, you were right to search out cheap flights to Mexico City. This is the trip of a lifetime. Book tickets to Mexico City today with Travelocity, and you’ll be standing before the murals of Diego Rivera in no time. Flights to Mexico City arrive at the Benito Juárez International Airport (MEX), which is a gateway to the capital city and its surrounding area. Once you’re on the ground, it’s easy to get airport hotels and accommodations a bit off the beaten path. You can purchase prepaid taxi tickets from the Taxi Autorizado booth in baggage claim, and many hotels also run shuttle buses from the airport. There's an airport metro station, and savvy travelers know its most easily navigated if you have some understanding of Spanish. You can also rent a car when you’re booking airfare to Mexico City so the greater region is accessible. No matter how you get to your accommodations, after a quick unpacking you’re ready to explore the ancient sites and strong flavors of this metropolitan gem. Once your bags are planted in your hotel room and you’ve changed into your walking shoes, it’s time to explore. After you’re done for the day, a quiet respite is just the thing you need. As it turns out, booking the right tickets to Mexico City isn’t the only deal breaker for crafting a memorable vacation. Staying at one of these popular hotels can also make all the difference in the world. Galeria Plaza Reforma: Situated in Zona Rosa, this 4-star hotel is an excellent place to kick off your shoes at the end of the day. A concierge and lounge ensure that you’re always comfortable during your stay, and turndown service leaves you feeling pampered. Krystal Grand Reforma Uno: The elegant Krystal Grand Reforma is a AAA 4-diamond property, and you’ll feel like royalty from the moment you walk through the door. Not only does the hotel have on-site dining and a presidential suite, but the world-class spa includes a cross-current pool for your relaxation. 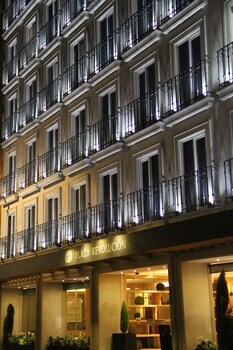 Camino Real Polanco Mexico: This hotel is intriguing from the outside, because the architecture is far from the norm. Once inside, your eyes will continue to guzzle interesting shapes and colors; the hotel has a private art collection. Perfect for the art lover, the Camino Real Polanco Mexico has modern rooms and a doting staff. Marquis Reforma Hotel Spa: The Marquis Reforma is the ideal accommodation when relaxation is top of mind. Enjoy the hydrotherapy tub, unwind in the sauna, and experience a soothing steam bath. When you’re ready to go to sleep, retreat to your art deco room and fall onto your plush mattress. Mexico City flights don’t just deliver you to a capital city. You’ll also find yourself in the heart of a city so beloved and alive that it takes your breath away. You’ll be enriched for exploring museums like the National Museum of Anthropology, discovering the city's sparkling Palacio de Bellas Artes and Chapultepec Castle, and eating and drinking your way across the city. Yes, you can expect your days (and stomach) to be very full. Don’t depart without stopping at the Frida Kahlo Museum and the Great Pyramid of Tenochtitlan. Book your cheap tickets to Mexico City today, wise wanderer, and in just the blink of an eye you could be standing in the historic center of Mexico City. Between the National Palace and the Zocalo, you’ll have stories to last a lifetime. The staff helped with wheelchair and getting me to my flight the next day in terminal 2. They were all amazing.